I’m cleaning because it helps me re-gain focus while working. Seven years of media and computing studies has made me a multi-tasking cripple incapable to work clear and with sharp focus. Moreover, I’m re-learning to use my hands practically in a job while earning money. I also ground myself by not doing any seemingly „superior, digital fake work“. I’m not appreciating my own design and digital work right now because I’m reducing its value. Hence I do the analogue job of cleaning as it helps me re-finding beauty in digital work. It resets me, motivates me and connects me more intensively to the „ordinary people“. 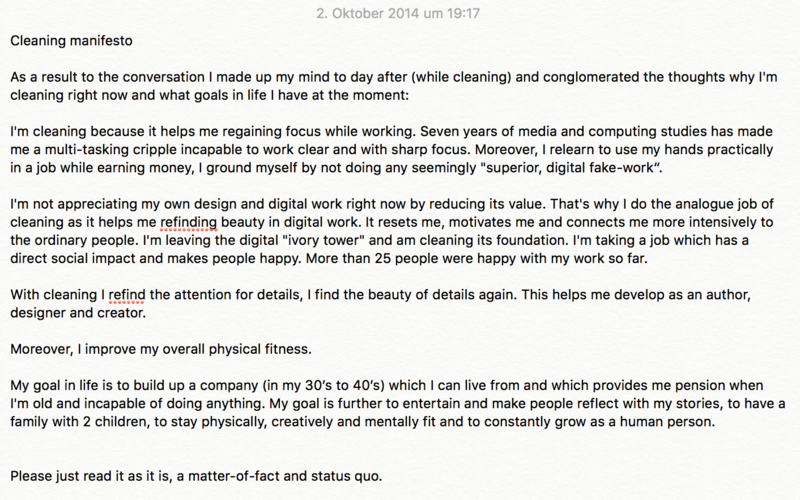 I’m leaving the top of the digital „ivory tower“ in order to clean its foundation. I’m taking a job which has a direct social impact and makes people happy. More than 25 people have been happy with my work so far. With cleaning I re-find the attention for details, I find the beauty of details again. This helps me develop as an author, designer and creator. Moreover, I improve my overall physical fitness. My goal in life is to build up a company (in my 30’s to 40’s) which I can live from and which provides me pension when I’m old and incapable of doing anything. My further goal is to entertain and make people reflect with my stories, to have a family with 2 children, to stay physically, creatively and mentally fit and to constantly grow as a human person. Please just read it as it is, a matter-of-fact and status quo.